Both my grandfathers, born in 1897, were conscripted into the Italian army when Italy entered World War I in May 1915, so in a way today's commemoration doesn't yet concern them. And yet in other ways it does, just as it concerns everyone who came after. For example my parents, born in 1926 and 1927, grew up in the shadow of that War and its effect on their parents (especially my paternal grandfather), until the horrors of World War II provided them with their own experiences of bombardment, enemy occupation and hunger. I don't know a great deal about their wartime experiences. I do know - from what I've read - that they would have served somewhere on the Italian front, which, stretching from the Tyrol to the Alps, meant especially harsh and difficult conditions. And I know that they too were "lions led by donkeys", fighting futile battles for the loss or gain of a couple of miles of terrain. But the other pieces of the jigsaw have come to me filtered through the memories and perspectives of my parents, and whatever else I may have gleaned along the way. Post-War photos of Nonno Giovanni show a man who looks confident, dapper, charming; a man successfully building a new life for himself and his family, and proud of this. But deep within he was falling apart, suffering nightmares, panic attacks and sudden bouts of uncontrollable shaking. This much my father talked about, and hinted, too, at heavy drinking, to cope with the effects of what we once called "shell shock" - but he never knew what exactly his father had endured and been so traumatised by. I only have fragments of this jigsaw, but I suspect my grandfather had some kind of breakdown in the 1930s, as he was admitted to a psychiatric hospital where he died in 1942, aged 45. These things were rarely talked about then and even in later years my father never asked his mother for details, so Giovanni Dallanegra remains shadowy and fragmented to me; all I know for sure is that the confident man in the photos was hiding a multitude of traumas. 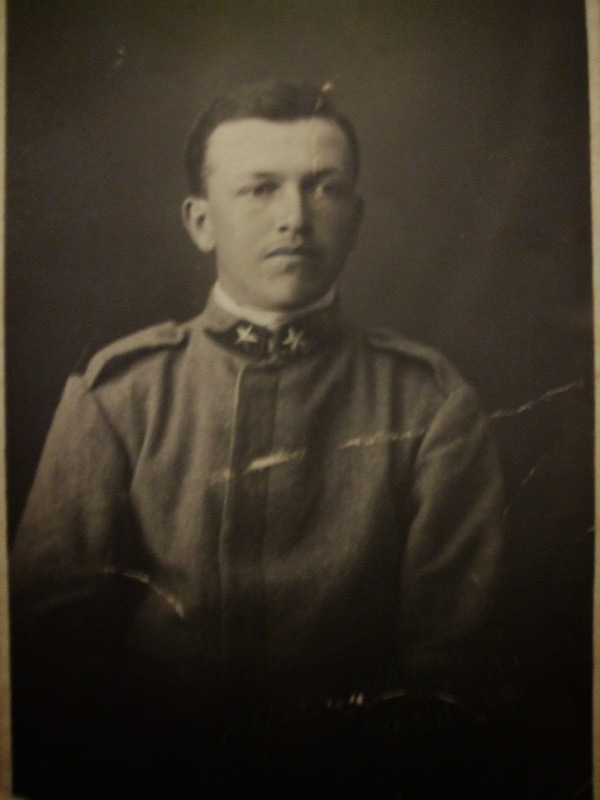 I don't have any photos of Nonno Secondo as a soldier, but I do have this one of Giovanni. I don't know when it was taken; maybe just before he ended up in the hell of the Italian front, which would make it one of very few photos of him before he was traumatised. But there is a shadow about his face which also makes me wonder what he has already seen... Anyway, I post it here to add Nonno Giovanni to the legions of photos of young men, proud, stiff or self-conscious in their new uniforms, gazing ahead unaware of the carnage which awaited them. As we remember them may we also remember the utter horror and futility of war, and redouble our prayers and efforts for peace around the world - may this be our commemoration and their enduring legacy.